America. The land of opportunity. A country rooted in the pursuit of The American Dream: a dream defined by life, liberty and opportunity. A country steeped in a culture driven by 44 proud leaders from George Washington to Abraham Lincoln to Barack Obama, and represented in pride and honour by an icon for freedom recognized the world over: the Statue Of Liberty, standing tall and proud. In an age rocked by wars, turbulent financial woes, and a natural environment at risk, we need to pull together and commemorate and honour the great icons of our age and for Americans to say I am proud to be an American. But how do we embody this respect and integrity in a commemoration that seeks to represent the very respect and integrity of America itself? 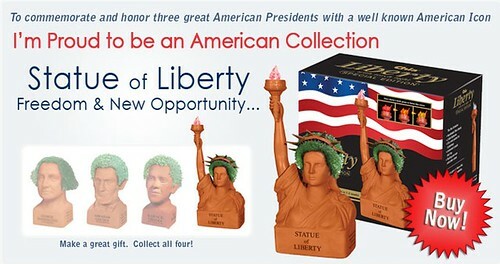 Yes that’s right, folks, four icons of America designed to have chia growing out as their hair. When I saw this I nearly spat tea everywhere. I have never in my 30 years on this planet seen such a ludicrous concept that so effectively gets to the opposite of what they are trying to achieve. I am not sure that “honouring” great leaders and symbols of a country is best identified with one of these crapolas of of humanity. I am also pretty sure that when George Washington said “Liberty, when it begins to take root is a plant of rapid growth“, he didn’t quite envision it this way. You’re american now, you can stop drinking tea. I haven’t felt this proud to be a ‘merkin since I visited http://www.peopleofwalmart.com. Hey, it how many people in other countries will voluntarily buy statues of famous national figures to adorn their homes, with or without puffy green afros? Ha ha, what a post. Haven’t read anything near as good on Planet Ubuntu for quite some time. Glad to see proper British sarcasm is being taught across the pond. I wouldn’t have thought it possible for a single person to express pride in being a collection, American or otherwise. Unless maybe the person in question has multiple personality disorder. hrmph, I actually wouldn’t mind a Snuggie. This better not be my Christmas present! So how many did you order? I think the only product that could possibly top that is Baconaise (I just realised how bad a pun that is). As ably demonstrated by Jon Stewart. Never stop drinking tea Jono.